Don't Forget the Keyhole Plate for Old Key Jewelry! Key jewelry is popular both for its symbolic meaning and availability. 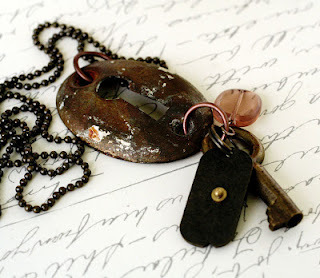 If you are like me, you probably have a box full of old keys just waiting to be tossed...or used craftily for cool recycled jewelry. But I never thought that the keyhole plate part could also be used! Catherine of Olive Bites does not provide a step-by-step tutorial but she has some simple tips on how to dress up old keyhole plates and use them for pendants and for bracelets. Those normal plate screwholes sure saves time as there is no need to drill holes for the jump rings! I really like this. Wonderful idea. That is so thinking out of the box!! !I love the idea...so creative! !